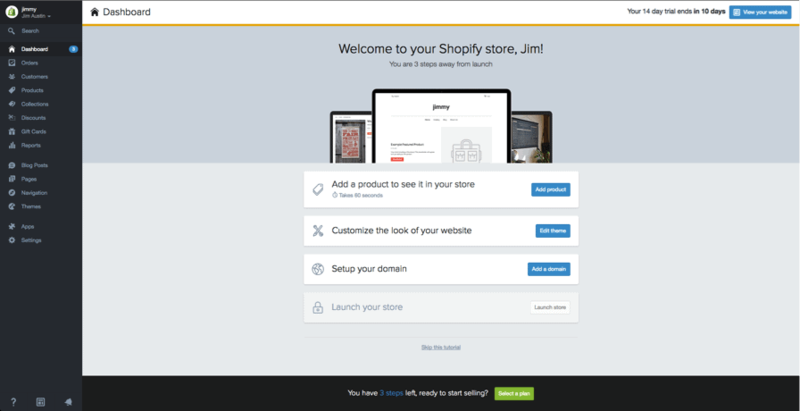 Here’s a step-by-step guide on how to build your own online shop with Shopify. I’ll cover all the basics and bit more, so you could get your online store up and running ASAP (We’re all busy, I know). If you get stuck (I doubt you will), leave a comment or get in touch with me via contact form. Signing up with Shopify and starting your store couldn’t be any easier and they even offer a 14 day free trial to get you going. To launch your Shopify store, you must sign up for an account. To start, visit Shopify.com. Use the signup form to start creating an account. Enter the required details and then click the ‘Create your store now’ button. Your store name needs to be unique or Shopify will ask you to choose something else. After this initial screen you’ll be asked for a few more details, these include your name, address, country and a contact number. You will also be asked if you have products and, if so, what you aim to sell. If you’re just trying out Shopify to see if it works for you, you can select ‘I’m just playing around’ in the ‘Do you have products?’ dropdown, and ‘I’m not sure’ in the ‘What will you sell?’ section. Once complete, click ‘I’m done’. After you’ve signed up you’ll be directed straight to your store admin screen. Now you are ready to start customising your store’s look, uploading products and setting up payments and shipping. Your home admin screen tells you all you need to know to get you up and running. 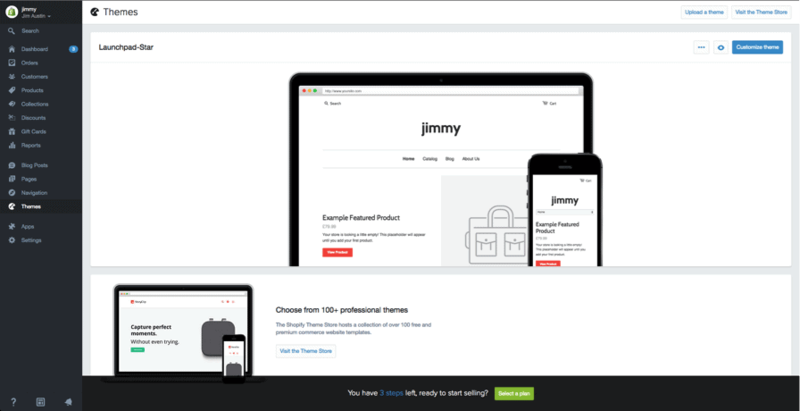 Shopify has its own official theme store. These themes are all guaranteed to have full support from the designers so you know your store is in good hands. All themes come with a comprehensive list of modifications you can make without having to touch a line of code. The premium themes come with more modifications, but that’s not to say you can’t achieve a great looking site with a free one. These changes are outlined in the next section. If you want to make wholesale changes to a theme, there are very few limitations on what can be achieved by accessing the HTML and CSS. Don’t worry if you haven’t got any coding experience. Shopify has an international team of design agencies they call ‘Shopify Experts’ that you can hire to fully customise your site. 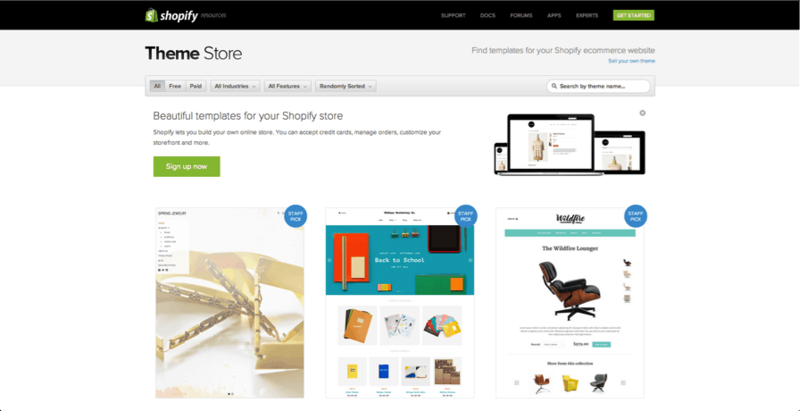 Log into Shopify and visit the Shopify Theme Store at themes.shopify.com. Here you’ll find over 180 theme variations to choose from, including a good selection of free ones. You can filter by paid or free, industry and by features. You can also sort themes by price, popularity, and most recent. Once you’ve found a theme you like, click on the theme’s sample image. You’ll be given more information about the theme, such as whether the theme is responsive/mobile ready among other features. Scroll down to read some reviews to find out what e-tailers using the theme think of it. To see the theme in action, click View Demo. You’ll see this below the green ‘Preview Theme in your Store’ button. If the theme comes in a range of styles, you can also view demos of the different styles by clicking on them. Once you’ve found a theme you like, click the green button. Shopify will ask you to confirm that you want to install the theme. Click Publish as my Shop’s Theme. Don’t worry if you’re not 100% sure it’s the right theme for you. You can always change your mind later. 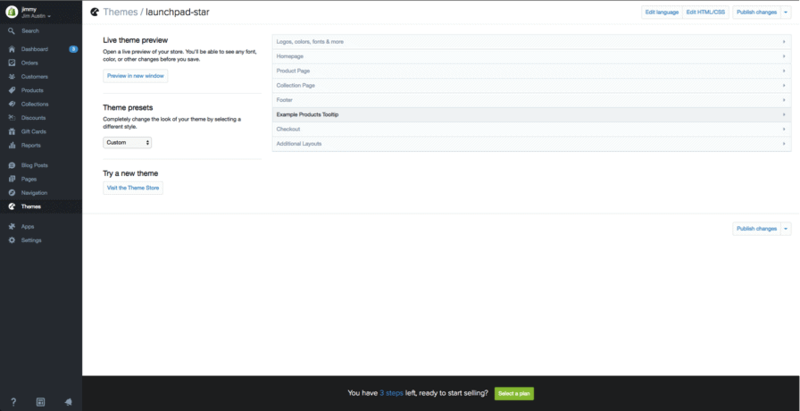 After the theme has installed, Shopify will let you know, and will give you the option to Go to your Theme Manager. Click this. Your theme manager shows published themes (the one you installed or activated most recently) and unpublished themes below (previously installed themes). The majority of Shopify themes allow you to make simple changes that can massively change the appearance of your store, so you can rest assured knowing you won’t end up with a website that looks like a clone of thousands of other stores. These stores are all built using the same theme. On your admin screen, select ‘Themes’ from the left hand navigation menu. On this page you will see your live theme in a box at the top, in the top right hand corner of that box will be two buttons. The first one is of three dots, which gives you some basic settings changes. One of these allows you to make a duplicate of the theme. We highly recommend you do this incase you make some changes you don’t like, then you can delete the duplicate and start again. The second button says ‘Customize Theme’. If you click that you will be taken to a page that controls all the basic functionality of your store. This is a great time for you to have a thorough play with the settings and test out all the features so you can find out what your site is capable of. Changing colours in your theme. Some themes will also allow you to reposition elements on pages such as showing product images on the left, right or center of the page. You can also choose whether you want to display social like/tweet/pin/+1 buttons. Again, navigating from the bar on the left select ‘Products’. You will then see a blue ‘Add a product’ button in the top right hand corner of the page. Use the following screen to add as much detail as needed about your products. Especially look at those that will help with SEO such as name, description and URL. Also include as much detail about variants as possible to help inform customers about your items. This is also the screen where you upload product pictures. Once the images are uploaded you can rearrange them so don’t worry about uploading them in any particular order. The Product screen. Make sure you fill out as much information as possible. Product images can make a sale so make sure you show your products off to their best and highlight any special or unique features with close up photos. To keep your store looking tidy we suggest you keep all images the same dimensions. Unless of course you plan to make your collection pages look like a Pinterest board. Once everything is filled out always remember to click the ‘Save product’ button in the top and bottom right hand corners. seasonal products such as holiday cards and decorations. Products can appear in any number of collections. Usually, you would display your collections on your homepage and in the navigation bar. This helps customers find what they’re looking for without having to click through your whole catalog. You add and remove products in a manual collection individually. You can set up selection conditions to automatically include products that meet certain criteria. A payment gateway allows you to take payment from your customers via your website. The price and commission rate is important, but it’s also important to see what features they offer. Not all payment gateways are created equal. You need to look at the following when choosing the right payment gateway for you. When you take a payment, some gateways will keep a small percentage or flat fee (or sometimes both) for letting you use their service. Compare these based on what your anticipated sales are. You need to know what types of card are accepted by your chosen Payment Gateway. All accept VISA and Mastercard, while most accept American Express. Paypal is also becoming popular for online payments. Some gateways will take the payment on their own servers via their own form. This means the customer is taken away from your checkout and they pay on the form provided by your payment gateway. They are then redirected to your confirmation page once the customer successfully pays. This allows you to have a bit more control of the checkout process. Now you can circumvent Shopify’s limitations in that they don’t let you customise the checkout other than with CSS. Payment gateway transaction fees are added on top of Shopify’s own transaction fees. However as of November stores based in the US and UK can use Shopify Payments. Depending upon your Shopify plan, you can save on these extra costs. Relative to your plan you will receive these highly appealing rates. Depending on how many transactions you make every month it could be worth upgrading to take advantage of these savings. If you live in the US or UK your store will automatically use Shopify Payments. To complete this, click the ‘Complete Shopify Payments account setup’ button found in Settings > Payments. If you wish to use a third party gateway you can use the ‘enable payment gateways’ link on the same page. Before your site can go live you need to add a few more details about your company and how you plan to make deliveries and pay tax. Make sure all your business information is filled out on this page. Also make sure to make use of the Google Analytics feature. This can prove to be an invaluable source for tracking your stores visitors. Click on the name of a given product. Scroll down to the section called “Inventory & variants”. Click on the edit link next to your Product Variant to open a dialog window. Make sure the checkboxes next to Charge taxes and Requires shipping are checked if you need to include these with your products. Some stores won’t need to charge taxes or shipping on products like digital goods. On the other hand, a T-shirt store will likely need to charge both. If you are planning to ship your product to customers, make sure to enter the product’s weight in the appropriate field. From your store admin, go to the Settings > Shipping page. In the “Shipping rates” section, look to see if you have set a weight-based shipping rate and adjust it according to your product’s specifications. To test your system you can simulate a transaction using Shopify’s Bogus Gateway. In the Accept credit cards section, click Select a Credit Card Gateway to open the drop-down menu. Scroll down the list to Other, then click (for testing) Bogus Gateway. Click Activate (or Reactivate, if you’ve used the Bogus Gateway before). Make sure you’ve set up the payment gateway you want to test. Make a purchase from your store as a customer would, and complete checkout using genuine credit card details. Cancel the order immediately, to refund yourself and avoid paying transaction fees. Log in to your payment gateway to make sure the funds went through. Yes – just be sure to cancel and refund the order soon after you place it. If your billing cycle hits after you’ve placed the test order but before you cancel it, the transaction fees will appear on your bill. You can still cancel after paying your bill to Shopify, but you’ll receive the refund as a transaction credit on your account. You can use transaction credits to pay future transaction fees. To get your site live you’ll need a domain name. You have two choices for this. Firstly you can buy a domain from Shopify and it will be added to your store automatically. This saves you time, especially if you have no knowledge of hosting a website. These domains typically cost $9-$14 USD per year. Your second option is to purchase a domain from a third party such as GoDaddy. These domains start from $1.99 USD a year. The downside is that you’ll have to redirect the DNS records yourself which can seem daunting at first. If you’re unable to come up with a good domain name, read my tips on how to choose a domain name. 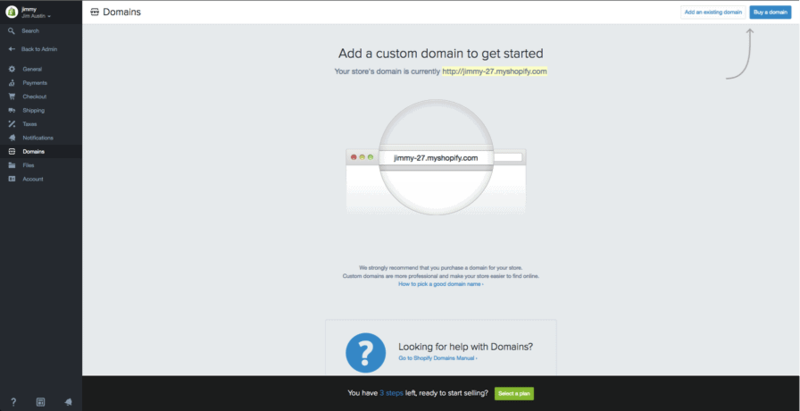 Here are the steps to put your new Shopify store live on a third party domain name. In the Shopify admin, from the left hand navigation go to Settings and then Domainsand add your domain name using the ‘Add an existing domain’ button. Otherwise no one will be able to access your site even once it’s live. Ensure that you also check the ‘Redirect all traffic to this domain’. This means that traffic to all other domains will be directed to your primary domain. This is crucial for good SEO. You can repeat steps 1 and 2 with other domain names you own. All domain names will redirect to the ‘Primary’ domain, which you can change at any time with the ‘Set as primary’ option next to each domain name. Note that the number of domain names you own has no influence on SEO. And that is all there is to it. In theory you can have a great looking, unique and fully-functioning store in less than half an hour without having to be a web expert. This way you can spend most of your time marketing your product rather than having to maintain the site. I’ve been mainly using WordPress & WooCommerce combo (cheaper & easier), but Shopify can be a good alternative. Furthermore, you can actually build an ecommerce site with website builders, too. If you want to check them out, read my website builders review here. In regards to customisation, Shopify allows almost every aspect of their templates to be altered in some way. You can also change the functionality of most parts of your site. On top of this they also have the largest app store for added functionality. Comparatively, Volusion only has one template that can only have minor changes made to it. The only real downside is not being able to fully customise your checkout. Shopify restricts access to this page for security reasons. However the checkout comes fully responsive, so it will work perfectly for customers shopping on mobile devices.